Unblocking ourselves starts with knowing ourselves. This two-part session is about knowing self through the work of Murray Bowen, who created a very useful and relevant leadership system. Here’s part 2. Hey, it’s Hugh. I’m back with Session #9. This is part two of unblocking what blocks you have using the lens of Bowen systems. It is a leadership system, eight concepts. I am going to deal with the subsets. In this theme of how a conductor orchestrates success, how do you orchestrate success with the enterprise that you lead? You are the person of influence. Your orchestra, your team, your board is a reflection of your skill. Converting passion to profit, and profit is not only about the money. The money flows, which empowers our journey and our organization to meet and fully achieve its mission. Whether you are running a so-called nonprofit—that is not a philosophy, it is a tax classification—we need to drive bottom-line revenue, and profit is what happens as a result of the work. We as leaders set up problems, and then we blame other people. We blame the economy or the world. In fact, what started with us has turned into a problem. Let’s look at some of the things that happened in any group emotional situation. I talked about the eight concepts. So if you have not listened to podcast #8, go back and listen to those eight concepts in podcast #8. 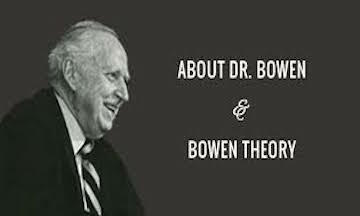 Now I am going to talk about some of the other themes, the Bowen language, that fits under those eight concepts that is relevant to the work and the thinking and systems as a biography of Murray Bowen. On the page hughballoupodcast.com is a list of all of the podcasts. Click on the link, and you can read the transcript and get the links and handouts (if there are any) for what I talk about on these podcasts. There are a whole lot of other things that relate to what I am talking about on the podcast. The journey begins with the page where you can go to the links. Find out more, and there are links on the two pages about Bowen systems to the Bowen Center at Georgetown University. I would suggest that you go and check out those links. There are links for the books by Roberta Gilbert who wrote in a very systematic way for church leaders, community leaders, and business leaders. She is in the process of creating a textbook for psychologists and psychiatrists who are studying for degree work. There is a comprehensive system for them to think through the brilliance of what Murray Bowen created. At this point, I have been in an eight-year study with Roberta and others to understand more fully how these concepts apply to my life, to the lives of my clients, and to the lives of other people in other groups where I present, teach, and facilitate workshops. It has given me an incredible lens to look through and understand what is going on in a systemic way. Thinking in systems, staying out of my emotional reacting, and then responding to what I see after observing and thinking about what is really going on. Ultimately, Bowen systems is about managing self. Managing self begins with guiding principles. I work with organizations doing strategic planning. We start in the early stage of the planning by envisioning the future and anchoring ourselves in our core values. Core values of those nonnegotiable items, like integrity, honesty, fairness, etc., that hold us in place, that attract us to an organization. If they are not there, those are deal-breakers. We are out of here if we can’t trust people, if there is not a sense of trust and integrity in the organization. These are very firm anchors we must have. However, once we write them, they are pretty much useless. We think about them in the lens of honesty, integrity as we are doing our planning process. We have not really defined what integrity, honesty, and fairness are. We don’t have anything to guide our decision making. Guiding principles are a statement that guides how we use those values in making decisions. It frames the decision making and principles. We move from a rules-based culture to a principles-based culture. Using the foundation of our core values, we write our guiding principles. The guiding principles are statements that we use to make decisions. My number one guiding principle is to always attempt to remain calm; approach conflict openly, directly, calmly; and using language that does not include the word “you.” Fact-based conversations directly toward the person with the person, engaging the person. That is part of the conflict. When there is conflict, I know that everyone in the conflict contributes to the situation. The number one rule is to remain calm; approach the conflict openly, honestly, directly; and state the facts. My number two guiding principle is to refer to number one. It is important to remain calm. Guiding principles are those foundational principles that guide us as a leader. It is really important that we know how we manage ourselves fundamentally. 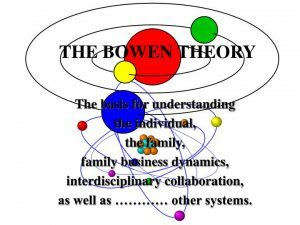 The Bowen system is about how we manage ourselves. It is under that concept in the last session of differentiation of self: managing the self, knowing self, understanding how we are going to make good decisions based on knowing ourselves. Guiding principles are statements that guide our decisions personally, as well as those decisions in organizations. These written principles provide a foundation for differentiating self and for alignment with groups. Without guiding principles, we are creating potential conflict. People see things differently, and they approach things differently if it is just a static description, like a core value. We have taken a static description of a value and have turned it into an active principle, a guideline for making decisions. It is really key for organizations to have their guiding principles, to keep them anchored. The second term I want to deal with is that one about anxiety. I said I stay calm and approach the conflict directly and openly. Anxiety is contagious. As a cow hits an electric fence and starts to run and make noise, the rest of the herd follows the cow because the rest of the herd is influenced and infected with that anxiety. The exact same thing happens in any human group. And we as leaders spread the anxiety even if we try to hide it. Anxiety is contagious, and it infects the group. It moves the group from thought-based decisions, thinking decisions to emotional reacting. We must stay out of emotional decision-making and stay in well-grounded principle decision-making that is thinking, not feeling. 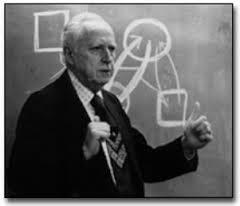 It’s the antithesis, as you see in the biography of Murray Bowen, of what Freudian principles teach. When the leader is anxious, that emotion spreads to everyone in the group. This leads to everyone in the group’s emotional system potentially escalating the emotional state and making decisions based on emotions rather than using sound thinking. That is what I want you to think about with anxiety. Another term is the focus child. When the leader focuses the negative energy on one person, it’s like the parent blaming one child conditionally for bad behavior. This is a downward spiral where the focus child, or the blamed person in the group, actually takes on the behavior that they were accused of. In the family, we blame Johnny. Johnny is a bad boy, so we dump all the negative energy onto Johnny, and then others follow suit. Johnny learns to attract that behavior, and he takes on that behavior because that is how we have described him and that is the energy that Johnny receives. That is what he learns. Johnny goes to work, goes to the church committee, goes to the community foundation board, and he works as the focus child. He behaves as that person in his family, attracting the negative energy. When we see a person in our group that does that, we need to stop that cycle and not play into that because we only promote the behavior. We need to stop, create a space, respond with thinking, not emotion. Situations vary. Realizing that person is creating that trauma, we don’t add to that anxiety. Basic self and pseudo self. These are the terms Bowen uses when we are within or outside of our guiding principles. Basic self is making decisions using our guiding principles. Pseudo self is making decisions to gain the favor of others, regardless of our own principles. I am a pleaser. It is really hard for me to think in terms of fact-based, principle-based decisions in wondering if a person is going to like me because I’ve made the decision. I have learned that if I make a principle-based decision in my thinking self, ultimately the person who I thought may or may not like me will ultimately respect me for making the principle-based decision, and I don’t trigger the emotions and go into a downward spiral that is not productive. Another term is fusion. There are people so fused with another human being that they cease to be an individual, and they cease to be able to make individual decisions. Reflexive or automatic. Behavior and family moves toward undifferentiation or fusion of others. The condition of fusion is the eclipse of one self by another self, or by a relationship system. When fusion occurs, an individual loses personal distinctive attributes and becomes lost or submerged in the characteristics of the other or the relationship system. Some people are so closely fused with their spouse that they cease to be an individual—they are not differentiated. Some people are so closely fused with their dead parent(s) that they cease to be able to make independent decisions. Remaining differentiated and separating ourselves from those people with whom we have been fused is a way of using our guiding principles and being fully differentiated and managing self. Here is a big one: a nodal event. A nodal event is a significant change, such as migration that begins with many changes. In retrospect, a nodal event appears as a turning point in an intergenerational history of a particular family. Patterns of interaction in these periods generally reflect important characteristics of the overall functioning of a family. Nodal events also include birth, marriage, death, divorce, illness, institutionalization, and occupational change. These complex major shifts in a family’s relationship network trigger automatic behavior patterns that may or may not be adaptive for the family undergoing these changes. Having a death in the family spreads through the whole culture, and these behaviors emerge. We have lots of decisions to make as leaders, and some could be a nodal event in someone’s life. Therefore, this will trigger behaviors. Having this lens to look through helps us make better decisions as leaders. This is a very simplistic top-level view of Bowen systems. There is a whole lot more to learn, a whole lot more to discover. I recommend that you go to Amazon and look for the books by Roberta Gilbert. A good starter book is Extraordinary Relationships: A New Way of Thinking About Human Interactions. It is a good way to start. There is a book on the eight concepts of Bowen theory, and there is a book called The Cornerstone Concept, which deals with the concept of guiding principles in a very comprehensive way. There is a lot to learn. Thebowencenter.org is another place to find more information about the work of Bowen and this great system of thinking about self, learning about self, and becoming a better leader. The eight concepts of Bowen systems. This is Hugh Ballou, and this is podcast #9. The next podcast is an interview with Roberta Gilbert, where she reviews the life of Murray Bowen and talks about his legacy. This starts a series of interviews about legacy. #10 is Roberta Gilbert on the legacy of Murray Bowen. I’ll see you on the next podcast. Here is a tip for the weary and the frantic. When you start feeling anxious, start thinking in systems. What is causing the anxiety? What is your emotional trigger? Take a breath. Get out of the emotional reacting. Begin thinking in systemic ways to be able to move out of emotional reacting and having a thinking response. You’ll be glad that you did. Statements that guide our decisions personally as well as in organizations. Written principles provide a foundation for differentiating self and for alignment in groups. When the leader is anxious, that emotion spreads to everyone in the group. This leads to everyone in the group emotional system potentially escalating the emotional state and making decisions based on emotions rather than using sound thinking. When the leader focuses the negating energy on one person is like the parent blaming one child continually for bad behavior. This is a downward spiral where the focus child (or blamed person in the group) actually takes on the behavior that they are accused of. Basic Self is making decisions using our guiding principles. Pseudo Self is making decisions to gain the favor if others regardless of our own principles. Reflexive, or automatic, behavior in families moves toward undifferentiation of fusion with others. The condition of fusion is the “eclipse” of one self by another self or by a relationship system. When fusion occurs, an individual loses personal distinctive attributes and becomes lost or submerged in the characteristics of the other or the relationship system. A nodal event is a significant change, such as a migration, that brings with it many related changes. In retrospect, a nodal event appears as a turning point in the intergenerational history of a particular family. Patterns of interaction in these periods generally reflect important characteristics of the overall functioning of a family. Nodal events also include birth, marriage, death, divorce, illness, institutionalization, and occupational change. These complex major shifts in a family’s relationship network trigger automatic behavior patterns that may or may not be adaptive for the family undergoing these changes.